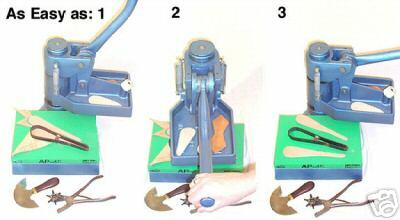 The surprising power and strength of this industrial quality clicker press sets it apart from all other presses in its class. 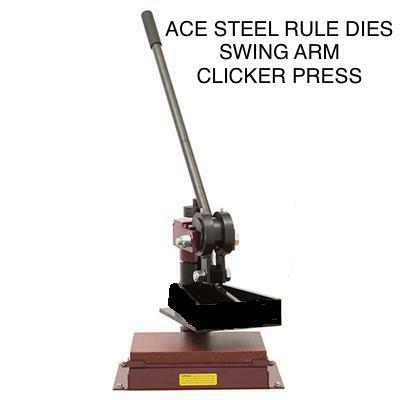 The ACESRD 5M manual clicker press with swing-arm cutting head can perform many types of die cutting with steel rule dies. Cutting board ---- 12" x 9"
Swing rotation ---- 360 deg. Due to the fact we only sell new machines all press sales are final. -Clicker board measures 8-3/8" x 11-7/8"
Serving the World's Die Cutting and Making Needs for over 50 Years!